I’m always thrilled when the mantle is covered with formal, engraved invitations. The thick, creamy stock and the elegant typeface promise an “occaision” to be remembered. The first thing that I do, after drafting my reply, is to think about what I’ll wear. Is it to be black tie? If not, should I wear a suit? If so what color and style? Which tie? Or what coat, slacks and shoes? For me, spending time in my walk-in closet is sort of like browsing at the bookstore. The possiblities are endless. And so it occured to me. 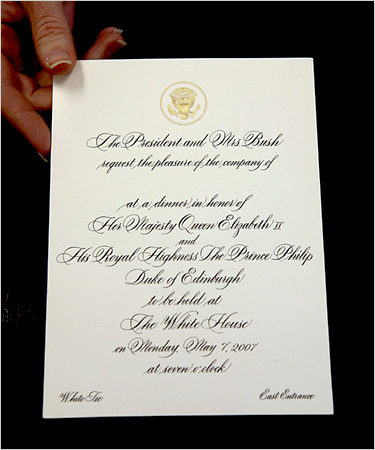 Most people do tend to rise to the occasion when receiving an invitation. As an operative in the Sartorial Intelligence Services, your mission is to stop the attack of the fifth column casuals amongst your friends and associates. Change happens from within, do something about the lackluster wardrobe choices you see your peers choose and invite them to step up their game a bit. Throw a party or a happy hour. But make sure that you send a formal invitation — NOT an e-vite — but a real live written or printed invitation to your soirée. It can be a postcard or printed on stock that works in your printer, or engraved if the evening warrents it. At the bottom left of the card, stipulate the dress code: Formal means black tie these days, after that things get murky for most people, so spell it out for them: “Jacket and tie,” or the more mundane “Business Dress.” “Cocktail attire” might work. “Elegant Casual” might give them cause to rethink yesterday’s jeans and tatoo t-shirt. You might consider a theme — Rat Pack night at the Zebra Lounge, Cocktails with Gatsby, Brideshead Revisited — and marry the attire, location and music to that era. Take plenty of pictures and post them somewhere that those on the guest list can access or send thank-you’s with a photo. Maybe your guests will like what they see. This entry was posted in Entertaining and tagged engraving, Entertaining, etiquette, invitations. Bookmark the permalink.